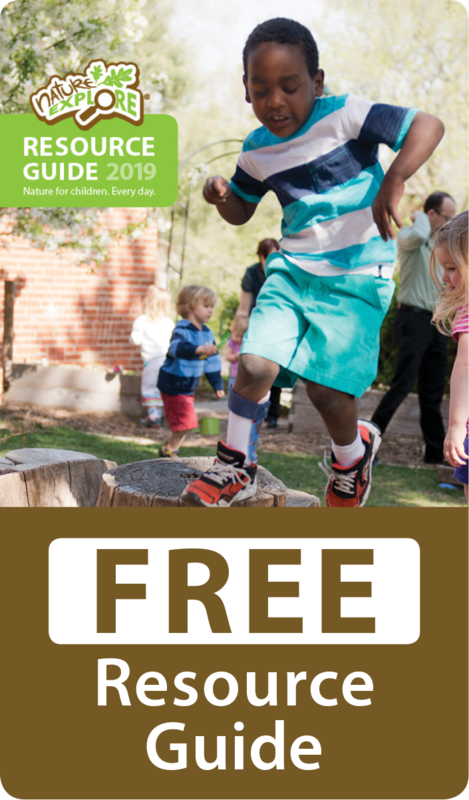 The University Children’s Learning Center (UCLC) Outdoor Toddler Classroom is an area that was designed with the needs of children under the age of three years in mind. 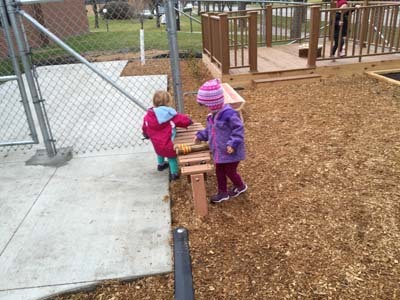 When the planning committee first began dreaming about an Outdoor Classroom it was important to them that the toddlers enrolled in our program have a space where they can feel safe and secure. 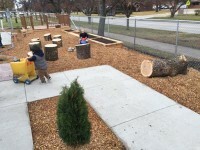 They wanted these young children to have their own outdoor learning space. The fundraising from the beginning included this separate secure area specifically for toddler-aged children. When you enter this space you can feel that it is for young children. 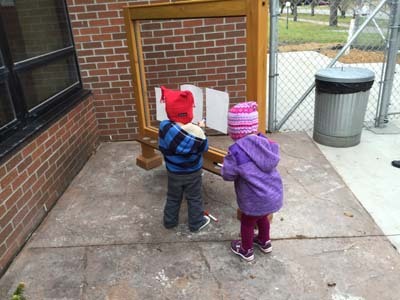 There is a large art easel that is 12” off the ground so they do not need to stretch and reach to be able to be creative. The Marimba was set further into the ground as well. It is along a concrete pad which allows the youngest of our standers to have secure footing while the more experienced toddlers can balance on the wood fiber on the other side. This allows for children of varying heights to comfortably use this piece to create music. The children also have smaller cactus sticks that fit their hands somewhat better. The wheeled-toy area is smooth and flat with square edges providing the opportunity to practice corners but in a more defined way. 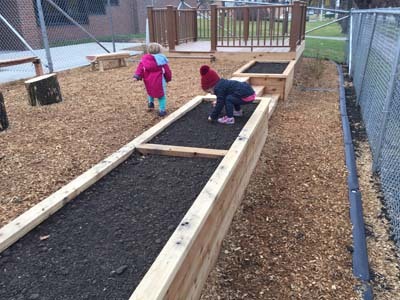 There are small plants in the center of this area that the children can easily toddle through as they explore their environment. Toddlers love to climb and need to work their big muscles to gain coordination. 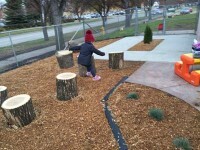 There are low stumps cut from Ash trees which allow the children to climb up and over or roam around and in between. Adjacent to this climbing area is the gardening and digging space. The planter boxes are recessed into a small hill. This allows smaller children to sit and dig as they garden. But on the other side children can stand and be able to comfortably reach as they tend to their plants. 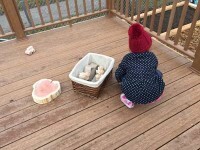 Lastly, our Outdoor Toddler Classroom contains a deck. 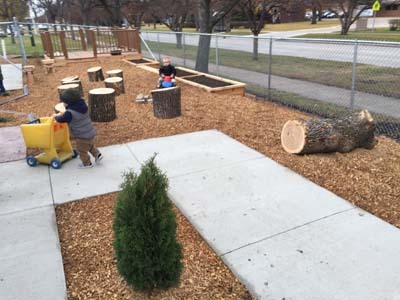 This space allows for many things to happen: the children can gather and listen to a story or share their own story; parents can sit with their child or a group of children; we can put out blocks or tree cookies and the children have a stable, firm surface to practice building on before they build on the wood fiber surface; or they can sit back and visit with one another like they are in their own backyard. All of these activities promote the sense of together; an essential part of the philosophy of UCLC. The UCLC Outdoor Toddler Classroom provides a cozy environment in which children can freely explore nature without feeling overwhelmed by too much open space. It is the perfect introduction to the great outdoors.